I received an e-ARC from the publisher in return for a review. I feel really bad about the way I treated this book. I ignored it. Set it off to the side when other, shinier books walked in front of me. Pretended I couldn’t hear it as it whispered my name to pick it up again. I left it to the dust unless it was convenient for me. I only gave it my attention if I was stuck somewhere with nothing but my Kindle for company, a last resort in the face of absolute boredom. And because of that I must apologize for The Best of All Possible Worlds. I severely mistreated you and therefore don’t feel comfortable in declaring a solid opinion about your merits. I started you in the waiting room of a doctor’s office in December, picked you up again while waiting at another appointment a month later, and our abusive relationship continued month after month until I started to take actually lunches at work and I turned to you for companionship. Over six months after reading the first apocalyptic pages, I finally finished it, feeling guilty at how I mistreated it after the end was so enjoyable. 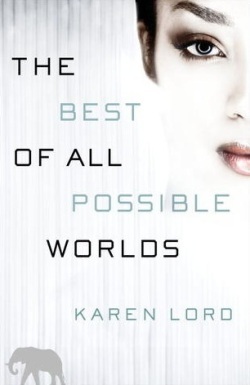 Karen Lord has created a subtle story about a misplaced people trying to find their place amidst their distant genetic cousins across a universe. It opens with a world destroyed, killing the majority of an entire sub-species of humans, and it ends with the remaining few finding hope that they can continue their traditions and pass on their genes in a slightly altered manner. It’s all very quiet with very little adventure and a truly adult romance built on understanding and intellect rather than passionate and a ridiculously strong libido. It’s truly an adult novel when I have buried myself in a sea of instant gratification YA books with page after page of adventure, witty dialogue and swoon-worthy romances. In retrospect I wish I had given The Best of All Possible Worlds the attention it deserved because once I started reading it more consistently – even just a few percentage points a day during my lunch – the magic created by Lord and her worlds of distantly related human sub-species was charming and understated, a perfect relief from the adventures I’ve been diving into. I received an e-ARC of this book from the publisher in return for an honest review, which makes me doubly guilty for mistreating it.